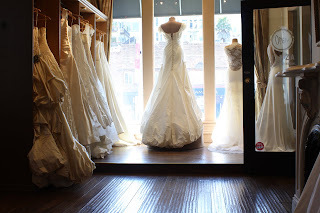 Sam and Maria spent a day in San Francisco touring a few key bridal shops for possible locations to shoot, and for ideas on lighting, layout, color and set design. 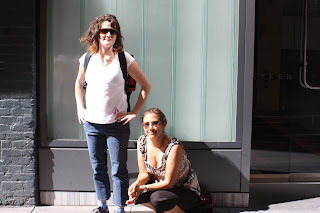 It was a beautiful day in the city, and we took advantage of the weather and the positive reception we had everywhere we went. With gratitude to our assistant Olivia, we took a lot of photos and tried to be as stealth as possible. Some issues for consideration: parking, lighting, outdoor space, inside space, ability to get equipment in and out. We have a list of locations to look at in the East Bay and North Bay, after which we'll start the dialogue with the bridal shop folks about days and cost. 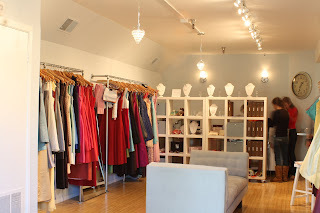 Special thanks to Amanda at Bella Bridesmaids and Jinza the amazing designer for their hospitality and kindness. Thanks also to Glamour Closet for letting us pop in unannounced. Love the red textured walls. After sitting in a dusty box for four years, I pulled out the short script to the Bridal film and decided that we needed to make it. I called my co-writer (Mick Erausquin) and my filmmaking posse (Sam Murphy and my favorite cameraman Mike Epple), all of whom said they were excited and happy to be on board. Now begins the work. We had our first meeting last week, going over the script and making some scheduling plans. We have 7 months to gather a crew, a talented cast, equipment, and about $20,000 to complete the four-day shoot. I am, needless to say, both scared and excited. Step one: find the location, after which dates and people should fall into place. So, to you, faithful reader, film supporter and friend, this blog is being launched to record our progress, track our decisions, and most importantly to encourage people to donate so that we can make this film a reality. The story was inspired by several trips to bridal stores, which I faithfully visited with a very old friend who had asked me to be her maid of honor. 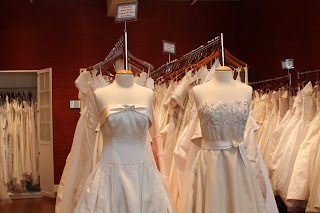 Having never been married (thus truly a "maid"), I had never really visited bridal shops nor searched for bridal clothing. Each trip got weirder and weirder, as I witnessed brides in the throes of excitement, nervousness, apprehension, confusion, and more. And every single one of them was accompanied by a friend, a family member, a parent, or all of the above. It was a unique combination of neurotic happiness and family dysfunction. The perfect setting for a little movie. As this blog progresses, we'll talk more in detail about the story and the production, and post photos and progress videos, so you can travel the road with us. Thank you for being there -- and as a donor, we'll see you at the screening.